"Even from the ashes, Notre Dame reminds us which direction is home," writes Monica Burke. 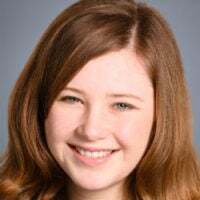 Monica Burke is a research assistant in the DeVos Center for Religion and Civil Society at The Heritage Foundation. I almost didn’t go to Paris. We were only a few weeks into our semester abroad in Italy, and I was still struggling with culture shock. Even though Europe was just as beautiful as I had always hoped, I was still frightened to venture too far from the comfort of our quiet apartment complex atop one of Rome’s many hills. We had a free weekend coming up and I still hadn’t made any plans to travel like the rest of my classmates. My two roommates invited me to come with them to France—a brief trip to Paris and Lisieux. I don’t know why, but I said yes. I will be forever grateful that I did. When our early morning flight touched down in France, I was completely disoriented. Between the three of us, we only knew enough French to order food and ask for basic directions. I tried to order coffee at a Starbucks in broken French while we waited for a shuttlebus. Somehow I ended up with hot chocolate instead. We boarded our bus and made our way to Paris. Our first stop: Notre Dame Cathedral. As a lifelong Catholic, catching sight of the looming towers of Notre Dame was almost unreal. This cathedral, for me, had always been a place from a long time ago in a land far away. Yet here it was, in all its glory. It was early morning, so we had to squint in the sunlight and crane our necks to observe the towers and striking steeple. It was also cold, early winter, off-season for tourists, so the square was relatively empty. It felt like we had the place to ourselves. We took a few photos and resolved to go inside later. 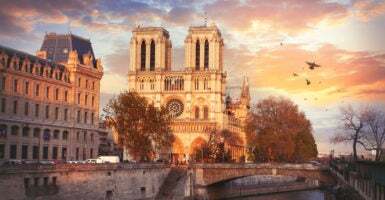 After walking along the Seine River, exploring the Shakespeare and Company bookshop, and sampling some authentic French pastries, we returned to Notre Dame for Mass. Tourists had to pay money to access the museum part of the cathedral, but since we were there to pray, we were able to go inside for free. Walking beneath the huge Gothic arches and past the stunning stained glass windows, I could not believe this church was made of tangible wood and stone. I was so used to encountering the cathedral as a painting or pixelated image on a computer screen that I could not fathom its scale and detail in person. It was resplendent. It transcended everyday experience and evoked the eternal. It was resplendent. It transcended everyday experience and evoked the eternal. As Mass began, my roommates and I realized we were seated behind a young French family—father and mother, daughter and son. The little ones could not have been more than a few years old. I observed them throughout the Mass, as these parents lovingly showed their children how to make the sign of the cross and showed them when to sit and stand and kneel. For the first time in months, I felt at home. This image of love, which could just as easily have been found in any other church in any other part of the world, felt so personal. I smiled at this family during the sign of peace and thanked God for them. Immediately after Mass, my roommates and I knelt to say some prayers of thanksgiving after Communion, and we were surprised that everyone else around us was staying too. What we didn’t realize is that, during Lent, pilgrims at Notre Dame have an opportunity to venerate the Crown of Thorns, a relic believed to be the true crown of thorns worn by Christ during his Passion. Suddenly, we were enveloped in sweet incense, and the priest brought out the crown. I immediately began to cry. I had frequently meditated on Christ’s crowning with thorns that semester as a prayer for a special intention. And here it was, the very crown! I could not believe it. It had to be Providence. I thought Notre Dame would always be there, waiting for me. I still cannot fathom what we have lost after this devastating fire. The medieval stonework preserved the most sacred part of the church, the sanctuary, and a brave chaplain accompanied firemen to rescue the Crown of Thorns and the Blessed Sacrament. Even after the fire, the most essential elements were preserved. Even from the ashes, Notre Dame reminds us which direction is home. We do not spend hundreds of years building grand cathedrals “just because.” These sacred spaces bring us closer to God. They remind us where we come from and where we are going. Even from the ashes, Notre Dame reminds us which direction is home. The overwhelming sense of grief shared worldwide after the fire is a testament to this truth. Notre Dame is more than a landmark. It bears spiritual meaning. How fitting that this should have happened during Holy Week, when we meditate on death being overcome by new life. That is why we must rebuild—not out of nostalgia, but for the sake of what really matters. I will be forever grateful that I had the chance to experience the beauty of Notre Dame. Yet I am even more moved by the project that lays ahead of us. To rebuild is to refocus our lives on what is most important, what I found at the cathedral—family, friendship, and most of all, faith. I, for one, am eager to begin.